When buying a cookware set, whether to replace an existing one or as a first purchase, there are a huge amount of different products to look at. Here were are looking at stainless steel cookware reviews to help you decide if these would be the choice for you. One of the first thing said about any stainless steel cookware set is the fact that it will last for year after year. Stainless steel offers an uniform strength which means it is very resistant to being scratched and dented due to its combination of materials. Stainless steel is also anti-corrosive so it will not rust and has no chemical coatings which can contaminate food, especially acidic foods such as citrus fruits or tomatoes. There is also no concerns about invisible fumes containing toxic elements as there are no coatings to cause this. All that is needed to clean stainless steel cookware is soap and water and is usually dishwasher safe also. Should an accident occur, stainless steel can also withstand a scrubbing without being permanently spoiled. Stainless steel can also be more hygienic than other options, as there are no crevices for food matter to hide in and generate bacteria. The dense material used in the cookware also stops staining and discolouration of the pans which can lead to transfer of tastes to the wrong food. The special design featured in stainless steel cookware means it distributes heat evenly across the whole of the pan so that there are not areas which are hotter or cooler than the rest of the pan. Stainless steel can also withstand greater cooking temperatures to start with, so can be used when high levels of heat are necessary. While style and appearance are not a big issue to everyone, if you are designing a kitchen and want that coordinating element, then stainless steel is found across a variety of appliances and other cookware to allow that. It is easy to keep clean when not in use and simple to store, without worry about scratching sensitive interiors. The Calphalon Tri-Ply set is designed in a classic stainless steel style with polished exterior and a stain finish on the inside. It is oven and broiler safe and can be cleaned in the dishwasher with no problems. It can be used on any stovetop, including induction and features stay-cool handles so the pan gets hot, not your hands. 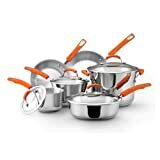 The Cuisinart MultiClad set is made from tri-ply 18/10 stainless steel around an aluminium core with a brushed exterior and a mirror-like interior finish. The handles are made from solid stainless steel so will stay cool and are riveted to the pans to add strength. The lids are also made from stainless steel and are tightly fitting to prevent heat loss. The Cooks Standard set is made from multi-ply clad stainless steel with an aluminium core, and the interior is finished with premium grade 18/10 stainless steel for a smooth, hard finish. The handles are stay-cool and are made using their Air-Flow technology to achieve this while being riveted to the pans for strength. The pans are oven safe up to 500 degrees and can be used on induction stovetops as well as gas, electric and ceramic. They are also dishwasher safe. The All-Clad range is made from 18/10 stainless steel with bonded aluminium base to maintain even heat distribution. It can be used with all cooktops, including inductions, in the oven up to 350 degrees and is also dishwasher safe. The pans also contain measuring marks to easily add ingredients in the right amounts and specially designed handles to make it easy to undertake tasks such as sauté, stirring and even carrying the pans around. The Duxtop range is made from tri-ply stainless steel while its handles are made from stay cool stainless steel and riveted to the base for extra strength. It is oven safe up to 550 degrees and can be cleaned in the dishwasher. The Rachel Ray set features a thick aluminium base encased in stainless steel for quick and even heating of the pan. The handles are a fun orange colour but are rubberised for safe use and double riveted to ensure strength. The pans are oven safe to 350 degrees while the glass lids of the pans allow monitoring of the contents without releasing the heat. These are just some ideas of the range of stainless steel cookware which are available on the market to give you a flavour of what you can invest in.